The SMH3 is a Bluetooth 3.0 stereo headset with Bluetooth intercom designed specifically for motorcycles. With the SMH3, you can call handsfree on your Bluetooth mobile phone, listen to stereo music, and have two-way intercom conversations in full duplex with a passenger or other riders. Thanks to the latest Bluetooth 3.0 and the advanced digital signal processing technology, the SMH3 offers the best sound quality for both incoming and outgoing sound in its class. Also, the easy-to-access and intuitive two-button operations make the SMH3 a perfect companion for motorcycles. It has a unibody design integrating main unit, control panel, speakers, microphone, which enables users to install the system more simpler and easier. Intuitive two-button user interface is provided on the boom microphone within a quick hand’s reach. One of the main important factors of using a headset is to stay connected and having Bluetooth capability is a must when on the road. All of Sena’s headsets come standard with Bluetooth 3.0 technology which allows riders to wirelessly make mobile calls, listen to stereo or MP3 player music or audio instruction of GPS navigation. Riders can also effortlessly hold conversations with another motorcyclist or the passenger via the Bluetooth intercom system. One of the most technologically advanced features Sena Bluetooth offers its users is two-way intercom system with a distance up to 200 meters or 220 yards. An important feature customers value is the quality of the audio sound from their headset. Sena’s full product line provides crystal clear, natural sound quality, and is integrated with an audio booster providing sufficient sound level for noisy environments. With a noise reduction mechanism built into the headset rides can enjoy a clear and loud level of audio with audio boosting. Sena customers have the option of registering their headsets which will allow for updates regarding new firmware options. Firmware upgrades allow Sena’s headsets to always operate at their peak and have the most up-to-date functionality and options for rapid technological advancements in smartphone and Bluetooth device. The firmware upgrades are available for free when available to all registered Sena customers. Safety is a key factor when out on the road and Sena has integrated voice prompts into all of their units to ensure riders can maintain handsfree control. Voice prompts allow riders to operate functions such as GPS, volume control, mobile phone calls and more without needing to take their hands off of the handle bars. Sena provide voice prompt options for multi-language, English, French, German, Italian, and Spanish.This is necessary to ensure safety is maintained during times of traffic or congestion. 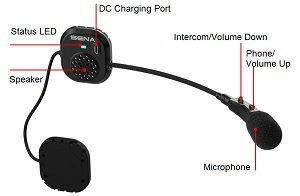 Sena SMH3 Bluetooth Headset, USB power and data cable, 2 microphone sponges, 2 male and 2 female velcro pads for speakers, instructions, warranty card. The SMH5D-01 is a Bluetooth v3.0 + EDR Class 1 Stereo Headset with long-range Bluetooth Intercom des..
Sena Expand Bluetooth IntercomThe Sena Expand is a Bluetooth Stereo headset with long-range Bluetoot..
With SENA products and accessories, safety is a key factor when out on the road and Sena has integra..
Sena SMH10R Low Profile Dual Pack Bluetooth Headset/Intercom KitThe SMH10R is a Bluetooth 3.0 stereo..